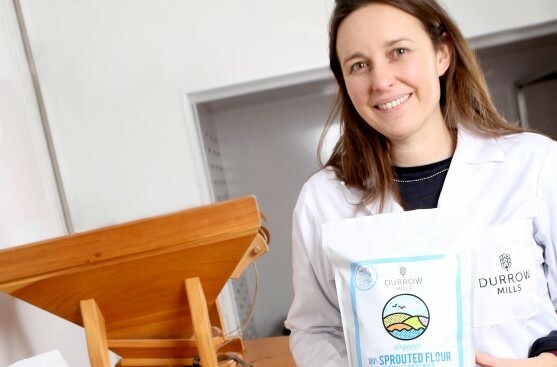 Durrow Mills was born through my interest in nutrition and clean eating so when digestive issues arose in my family, I decided to investigate healthier alternatives to traditional bread. I came across sprouted grains, which are healthier because the sprouting returns the whole grain to a plant state, breaking down inherent toxins, and allowing the body to digest it more easily. As sprouted flour was only available to buy from the USA, I decided to set up a business and make the flour myself. This decision was influenced by my long commute to Dublin from Westmeath for my job at the time and trying to juggle four young children on top of that. It took me 18 months to perfect the recipe and in March 2016, Durrow Mills was launched. An achievement I am very proud of as I am the only company in Ireland to produce sprouted flour. Since Ireland doesn’t have the ideal climate conditions to grow the high-protein wheat grain, grain is imported from abroad. I then sprout it, and mill it myself in a stone ground mill. I produce two types of flour: fine-milled multi-purpose flour, and coarse-milled bread flour. All my flour is certified organic. I hope you enjoy baking with my delicious and healthy flour! Try some of the tasty recipes available on the website. Feel free to send me any recipes you have tried and like or post them on our facebook or twitter site. Happy Baking!